Founded in the autumn of 2004 by nine musicians living in Reykjavik, Iceland, Storsveit Nix Noltes (Storsveit meaning 'Big Band') are a hugely talented and creative collective united through a mutual fascination for folk music from Bulgaria and the Balkan areas. Comprising of members of mum, Benni Hemm Hemm, Lost in Hildurness, Numer Null, runk, Kanada, Hestbak, and Kria Brekkan, among others, the group initially took shape at a class led by guitarist Hilmar Jensson at the Iceland Academy of the Arts (all were composition students except for Kristin Anna Valtysdottir, who at the time was the singing and playing as an original member of mum). Due to their sheer size and volume, the band's live debut at the school saw them marked apart from their student peers, being the only performance to include drums and electric guitars. After the show they were told that their music was far too loud and were advised to tone down. Instead, after continuing their path with a handful of rowdy shows at parties in school and at a local venue, local label 12 Tonar offered to put out their first record. Recorded in an old farmhouse in the countryside, during the long, dark days of the Icelandic winter, 'Orkideur Havai' was released on 12 Tonar in 2005. Well received locally, including a nomination in The Icelandic Music Awards as indie album of the year, Storsveit Nix Noltes soon found themselves playing much bigger venues and festivals, whilst continuing to enjoy the direct social connection and intimacy of playing in small venues where people would dance the whole night through. FatCat's Adam Pierce caught one of their immensely energetic live shows in 2005 and offered to release 'Orkideur Havai' in the US on his Bubble Core label in early 2006. For the first time, Storsveit Nix Noltes had the opportunity to tour much further afield, and were invited by Animal Collective as supports on both their European tour in November 2005, and in North America the following year, including a slot at SXSW festival in Texas. In the UK, they also opened up for Emiliana Torrini and Benni Hemm Hemm. 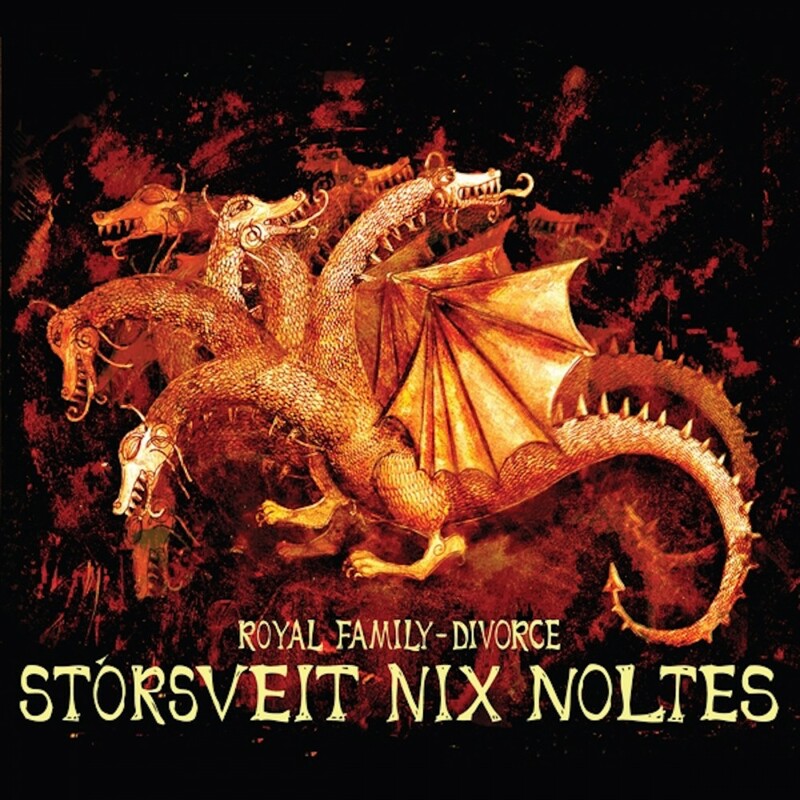 Now expanded to eleven members, Storsveit Nix Noltes recorded their second album, 'Royal Family - Divorce', outside Reykjavik during the last few sunny summer days of August 2006. Produced by the band themselves, the album was domestically self-released in December 2007. Remastered in October 2008, the record was picked up by FatCat and is set for its first release outside of Iceland in 2009. All the songs on 'Royal Family - Divorce' are transcriptions from traditional folk songs from Bulgaria and the Balkan areas. The transcriptions were arranged from CDRs and audio files, which in most cases contained little or no information about the composers or artists playing, leading to a long research process to ensure that all tracks were traditional songs rather than original compositions. SNN's vibrant instrumentals are an assortment of nimble, weaving tones and rambunctious, vividly orchestrated wild exuberance. Shadowy, thudding layers of unruly crescendos repeatedly teeter on the verge of chaos but the collective's remarkable musicianship and resilient ear for melody pulls the music away from complete disarray, accumulating in a captivating sound and a flamboyant, engulfing energy. The members of Storsveit Nix Noltes are Aki Asgeirsson (trumpet, cornetto and computer), Eirikur Orri Olafsson (trumpet - mum / Sigur Ros) Ingi Gar?ar Erlendsson (trombone, sousaphone and euphonium - Benni Hemm Hemm), Kristin Anna Valtysdottir (accordion - mum / Animal Collective / Mice Parade / Kria Brekkan), Kristin ?ora Haraldsdottir (violin), Hildur Ingveldard Gu?nadottir (cello - mum / Lost In Hidurness / Pan Sonic), Gestur Gu?nason (electric guitar), Hallvar?ur Asgeirsson (electric guitar, banjo), Gu?mundur Steinn Gunnarsson (electric guitar, acoustic guitar), Pall Ivan Palsson (double bass), and Olafur Bjorn Olafsson (drums, melodica).